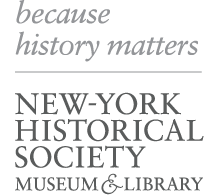 The New-York Historical Society’s Center for Women’s History is dedicated to exploring women’s central role in shaping our national past. Guided by a committee of renowned historians, the Center’s permanent museum installations, temporary exhibitions, public programs, and educational initiatives disrupt familiar narratives by bringing to light the untold stories of women across the spectrum of race, class, and culture. The Women’s History Council serves as the philanthropic engine of the Center for Women’s History and members enjoy special benefits, including invitations to salons—intimate gatherings that feature leaders in business, journalism, politics, the arts, and entertainment and offer opportunities to network with other like-minded individuals. For more information, contact Director of Individual Giving, Jeanne Thompson, at (646) 293-9906 or jeanne.thompson@nyhistory.org. IF THIS MEMBERSHIP IS A GIFT PLEASE FILL OUT THE APPROPRIATE FIELDS BELOW. SKIP TO PAYMENT IF YOU ARE JOINING PERSONALLY AS A MEMBER OR IF THIS IS A RENEWAL.